Do you want to watch home-authored videos or commercial DVDs* on your tablet, smartphone, or other device? Nero Recode lets you convert videos to the best playback quality possible. Want to get the most from your multimedia content? Nero 11 has all the tools and features you need to get professional results with your photo, video, and music projects, including Nero Recode. Or get the professional edge with Nero 11 Platinum and enjoy all the features in Nero 11 plus HD playback, templates, and more. Buy the latest and greatest features. Get the maximum HD edge with the total 360 - degree experience for your photos, music and videos. Give your digital media projects a boost with the fully-integrated and intensified Nero 11 Platinum. The robust suite is value-packed with productivity-enhancing features that push the boundaries of video editing, burning and backup as you know it. What you get is a true 360° HD experience for photos, music and videos with easy-to-advanced video editing workflows plus innovative video fi le conversion technology for multiple device playback. Best in its class, Nero 11 Platinum bridges the multimedia gaps with Nero cloud storage, Blu-ray Disc playback and mobile device support for Wi-Fi and USB syncing from PC to Android devices. The all-new Nero 11 is here! Finally, multimedia software that truly does what you need. Nero 11 empowers you to create, share your photos, music and videos like never before. The express video editing workflows, plus burning and backup are stepped up and seamlessly integrated with exciting features to give you a true 360-degree experience. Easy-to-advanced video editing, including innovative video file conversion technology for multiple device playback, gives you the full circle connection for your digital media needs. Want to create extraordinary videos with professional results quickly and easily? 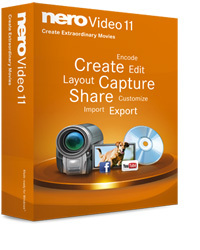 Nero Video 11 is designed with easy-to-advanced settings for creative enthusiasts who want to produce amazing videos. Take video projects to new levels with seamless workflows in Express Editing and Advanced Editing, With total media management, multi-track editing, and video effects with full keyframe control, Nero Video 11 has the tools you need for dynamic results. Nero Burning ROM is the industry standard for burning technology. 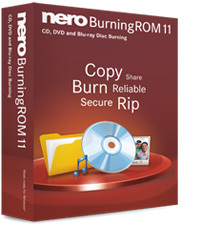 Get customized control of your burning projects with features in Nero Burning ROM 11 that let you burn and copy your most important data to CD, DVD, and Blu-ray Disc, rip audio CDs, split oversized files, and add encrypted passwords to your burned discs for extra security. Now you can get the highest level of backup protection for your photos, music, videos, and data. 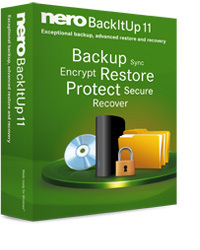 Nero BackItUp 11 comes with gold standard enhancements such as continual, secure system backup with Nero LIVEBackup and advanced restoration and recovery options with simplified settings and intuitive tools for your peace of mind. Whether you plan to use your Nero products in a corporate enterprise, academic institution, government agency, Nonprofit organization, Healthcare department or Legal services firm, the Nero Enterprise Licensing Program offers a flexible and cost effective way to deploy across networks your choice of Backup, Burning, Video Editing, or the full integrated Nero Multimedia Suite. Which version meets your needs? Nero Multimedia Suite 10 Enterprise is available in three versions, each progressively offering slightly more features over the other. Includes applications for secure data disc burning, disc copying and media management from the award winning full version of Nero 10. 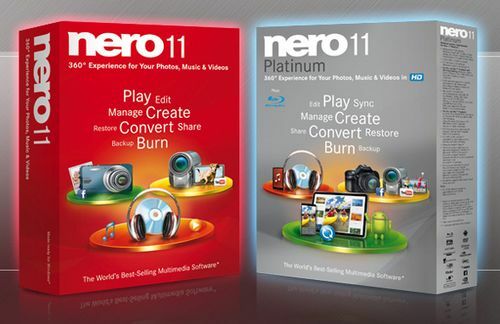 Offers the same features incorporated in the full version of Nero 10, including all media licenses for audio and video playback, DVD & Blu-ray Disc authoring, multi-track video editing, Autobackup, SecurDisc protection, plus convert Office 2010 PowerPoint to video for including in eye catching video and photo multimedia projects. Includes the same features of the full version of Nero 10, including more media licenses for audio and video playback including Blu-ray Disc Playback, hundreds of additional creative templates, transition and ThemePacks to embellish video and photo slideshows and movies, Picture-in-Picture effects generator for high impact overlays and presentation effects, plus export to Flash (FLV) video format.